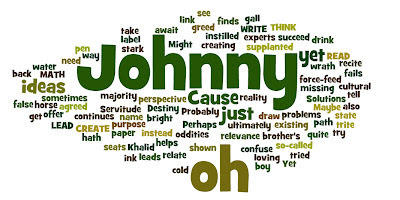 reachthenteach.com: Big Ideas About Teaching & Learning: "Johnny"
Big Ideas About Teaching & Learning: "Johnny"
Why oh why can't Johnny READ? Why oh why can't Johnny WRITE? Then have the gall to try to label him as "not too bright"
Why oh why can't Johnny do MATH? Why oh why can't Johnny LEAD? Why oh why can't Johnny CREATE? Why oh why can't Johnny THINK?